and is used to communicate the upcoming activities of this community. On your mark…get set… SLEEP! It’s time to bid a fond farewell to Daylight Savings Time and enjoy an extra sixty precious minutes with your pillow and blankets in the wee hours of Sunday morning. You will reap this benefit only if you remember to set your clocks back an hour before you tuck yourself in on Saturday evening, though, so make sure to make the adjustment! With luck, the extra snooze-time will leave you well-rested, ready for all the adventures of All Saints’ and hungry for…. … which will be served at 9:00 a.m. in the Undercroft by those gifted chefs the Stones. Cost is $5 per person, with a family maximum of $20. Come hungry, leave contented and ready to indulge in the education class of your choice. If you haven’t been photographed for the online directory recently – or at all! – now’s the time, while you’re rocking your other-worldly All Saints glow from your own magnificent virtue and your extra hour’s sleep. If you’d like to be recorded for posterity – or at least till the next first-Sunday opportunity – seek out Jim Milburn after whichever service you attend, and he will be happy to take your picture. Regular Godly Play will be held for Elementary School at 9:30 a.m. If your children are going to process in at 10:45 dressed as a saint, please come to the Godly Play room at 10:15 to help them with their costumes . Every child is invited to participate. There will be no Pre-K-K Godly play because of the Baptism. If you do not want your children to sit in church with you, please take them to the nursery. Procession of Saints -- Grace’s youngsters are invited to dress up as the saint of their choice and walk down the aisle during the processional. This is a great opportunity to investigate the strange and inspiring world of saints, teach your kids about some unique individuals and their many forms of faith and get them to pick a favorite. The possibilities are endless – there were bearded ladies, saints who fought dragons, saints who charmed animals, and other fascinating variations. Pinterest has some easy costuming possibilities. If you need an old-fashioned robe, there are plenty in our Christmas boxes which are in the supply closet. Service of Choral Evensong – Come and end your day in peace with choral Evensong later in the day. The choir will sing music by Stanford ( Magnificat and Nunc Dimittis ), Victoria (a lovely polyphonic anthem), and Sanders (Preces and Responses), and you will hear scripture and sing hymns and be free in about an hour to return to the world in a serene frame of mind – a rare treat in these times. The service will begin at 4:00 p.m.
· a SINGLE LITURGY at 9:00 a.m.
· Lunch for all in the Undercroft – free of charge! Childcare will be available during the service and meeting; the kids are welcome to join you for lunch, where there will be some kid-friendly eats available. With luck, you should be on your way rejoicing shortly after noon, full of tasty food and satisfied that you have fulfilled the role of Virtuous Citizen of Grace Episcopal Church. As you prepare to challenge the fortitude of your dining room table (or someone else’s) with various dishes of succulent abundance, consider making the holidays a little more plenteous for some of our neighbors whose tables will not face such trials of strength. Next time you’re at the grocery, buy a gift card in any denomination to give to Metropolitan Ministries. They will distribute the cards to their clients to help fatten up the Thanksgiving spread a little. You may put the cards in the alms-bags any time before Thanksgiving or bring them to the office. This year marks the one hundredth anniversary of the end of World War I. In remembrance of the achievements and sacrifices of those who fought it, the Chattanooga Symphony and Opera, Chattanooga Music Club and Lee University Singers invite you to a concert on Sunday, November 11, at 4:00 p.m. at Soldiers and Sailors Memorial Auditorium. A variety of patriotic pieces will pay tribute to those who have served their country. Tuesday, November 20 -- Thanksgiving liturgy and supper, 6:00 p.m. Advent Lessons and Carols, 5:00 p.m.
St. Nicholas Dinner 6:00 p.m.
I’m here in Des Moines, Iowa at the convention of the Episcopal Diocese of Iowa. It’s Saturday, and several hours ago you learned, as did we all, that a gunman entered Tree of Life synagogue in Pittsburgh. A number of people have been killed and wounded. Our Jewish neighbors, our brothers and sisters, are fearful and we must stand with them and provide comfort and support for them and for all. It is reported that the gunman not only ranted anti-Semitic sayings, he has also ranted and spoken against immigrants and refugees and other peoples. 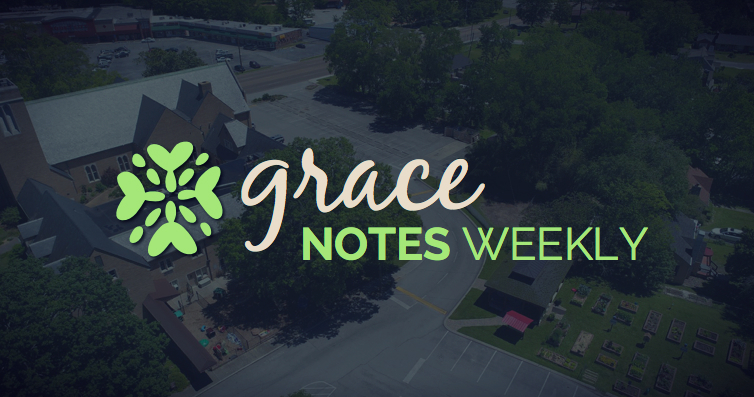 Centering Prayer (Barth Room) -- Friday, 1:00 p.m.
Grace Notes is a subscription list. You may have called the church office to subscribe or completed the subscription email form on our website. We only email people who opted in to receive emails and we gladly remove you from our database if you do not wish to receive any more emails. or use the unsubscribe link below.